Commercial warehouses and similar large square footage structures present unique challenges for pest control programs. 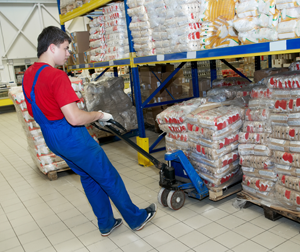 Pest infestations can destroy valuable inventory and create health hazards for warehouse personnel. For those warehouses that store food and other perishables, there are additional complexities. Many types of insects, animals, and birds can infest warehouses. Unfortunately, most warehouses and distribution centers, because of their very purpose -- the efficient receipt and shipment of merchandise – often have large access routes such as loading docks that remain open for extended periods of time. This wide-open access increases not only the likelihood of insect infestations but animal and bird infestations as well. For our commercial warehouse distribution customers, Cowleys offers one-stop comprehensive pest control services. In addition to our pest control division, which handles all types of insect infestations, we also offer raccoon and other wildlife removal services through our Little Rascals Wildlife Control Division as well as the removal of bats and nuisance birds such as pigeons, sparrows, and starlings through our Bird Division. Bird and bat droppings create major sanitation issues in warehouses, not only destroying inventory but also creating a health hazard for your employees. Dried droppings emit microscopic spores that readily travel through the air containing a host of disease-carrying microbes. Cowleys has the expertise to safely remove this hazardous waste. Cowleys has years of experience in Integrated Pest Management (IPM). IPM is the “gold standard” in pest control services. IPM techniques reduce the likelihood of an infestation and readily resolve an infestation should one occur without the heavy application of pesticides associated with traditional pest control. IPM focuses on prevention in order to minimize the likelihood of re-infestation; we determine and remove the sources responsible for the infestation and make the environment inhospitable by removing food and water sources and, for birds, setting up deterrent devices so they go elsewhere to nest. With IPM, applications are used judiciously and intelligently with the objective of optimizing their efficacy using the least amount of chemical. Not only does less chemical mean cost savings, but there is a safety issue as well. With warehouse employees working in the warehouse, many of which operate 24/7, chemical treatments should be used sparingly. Above all else, Cowleys’ pest management protocols are designed to protect the health and safety of your employees. The last thing a warehouse manager needs is to have an infestation problem compounded with employee complaints about respiratory and other exasperated medical problems from over-applied chemicals. With IPM, applications are only one element of a comprehensive treatment plan. The first step in protecting your warehouse contents and ensuring that your warehouse is kept pest-free is a thorough assessment. Cowleys focuses on any and all potential entry points for insects. We locate structural designs favorable to the entry of pests, and once inside, determine how the building structure facilitates their movement. Whether it’s pedestrian or overhead doors, electrical conduits, HVAC components or plumbing systems, Cowleys technicians determine food and water sources and harborage points for insects. Areas where food is stored and disposed of, such as employee break rooms, are given close scrutiny. Our objective to identify all current and probable insect “hot spots” such as sources of standing water – and then take corrective action. Warehouse IPM emphasizes the elimination of nesting sites and sources of water and food. While no one can make your building an impenetrable fortress from bugs, birds, and wildlife, you can go a long way to reduce avenues of access and make your structure inhospitable to insects. These preventative measures reduce the chance of a later infestation and if there is a later infestation the size and scope of the problem is much more contained. The IPM philosophy is that it makes little sense to get rid of an existing infestation without also taking steps to eliminate those underlying conditions that will likely lead to later infestations. Otherwise, you are just temporarily alleviating the symptoms without addressing the underlying foundational problems responsible for the infestation – and if those underlying issues are not resolved, the bugs will eventually come back. Sanitation is critical to any IPM program. Sanitation schedules are directly correlated to overcoming infestations both inside and outside of your building. Service record notebooks, sighting logs, application records and sanitation reports are all part of a comprehensive IPM program. By keeping sanitation under control, you stop pest infestations from getting out of control.